This is a very quick tutorial, an intro to rigid body dynamics with Reaktor in 3dsmax 4. I'm just going to touch on the basics of setting up a scene, to just give you an understanding of how to get a bunch of objects to collide with eachother as well as explain a few of the settings. After this I will probably go more in depth on various techniques with rigid bodies as well as soft bodies and rope and other elements of reaktor. So although this tutorial will be kind of boring in theme (a ball knocking over a few boxes) it will explain a few of the features and how to go about doing things. 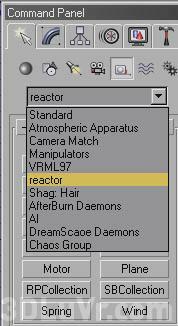 First of all load up the reaktor_template scene from the reaktor_files.zip. This scene has 3 blocks stacked ontop of eachother, a ball with a tiny bit of animation and a ground plane with side walls extruded upwards. Play the animation first to see what the ball is doing, just so you have an idea, it's just got a bit of key framed animation of the ball being thrown upward into the air before frame 0. This will come into play later on when we want to set up the initial velocity of the ball. From here you have a list of reaktor helpers, each of these represents a different type of dynamics (soft body, spring/rope ect.) what we want to make is a rigid body dynamics collection. 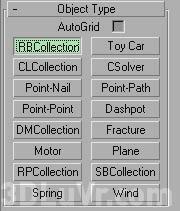 (A collection is where you are grouping all of your dynamics into one 'collection' this way you can specify what objects effect eachother). So click on the RBcollection button up the top left of the reaktor helpers button set, and click anywhere in one of the viewports to create it in the scene.